Lemon Slice Recipe: rich and lemony, these buttery Lemon Slice bars will take you back to the glass case at the old-fashioned bakery. Fresh lemon juice & zest give spectacular flavor! Well spring has finally sprung in New Hampshire and summer is not so far off. Fresh lemons and all things citrus remind me of springtime. Last week I had Old Fashioned Fresh Squeezed Limeade on the brain and this week I’m baking with fresh lemons. 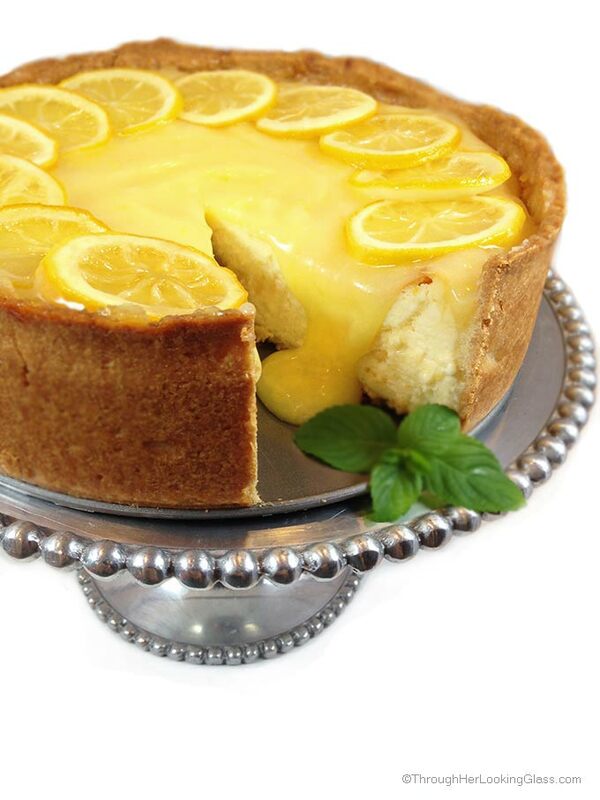 That mouth puckering tart and sweet, lemony flavor are irresistible this time of year. Do you have fond memories as I do of standing in front of a glass bakery case as a child? The glass case I remember most vividly was at Gregg’s Restaurant in Warwick, RI. Gregg’s has been voted many times “best desserts in all of Southern New England”, and I don’t doubt that is truth. The glass dessert case at Gregg’s was a round refrigerated one, taller than me, that slowly revolved. After dinner, every kid in the place would end up there, gawking and wide-eyed, as the immaculate case filled with whipped-cream dolloped slices of pie and cake, eclairs and every kind of cookie and bar known to man slowly revolved. Today, Gregg’s is still most famous for their enormous eclairs – “large homestyle eclairs filled with our own fresh Bavarian cream and topped with thick, rich, dark chocolate fudge frosting.” In a word, the eclairs at Gregg’s are heavenly. 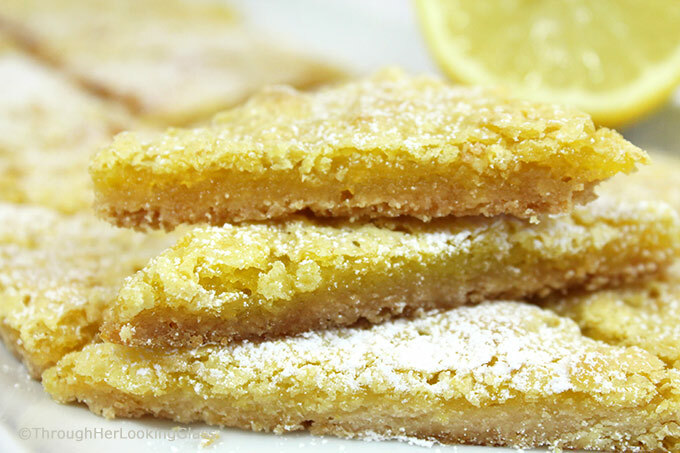 My mom and I have been been making this Lemon Slice Recipe for as long as I can remember and they’re so easy to make too. This recipe makes a big panful. The slices are thin, buttery and crunchy and it’s hard to stop at just one. 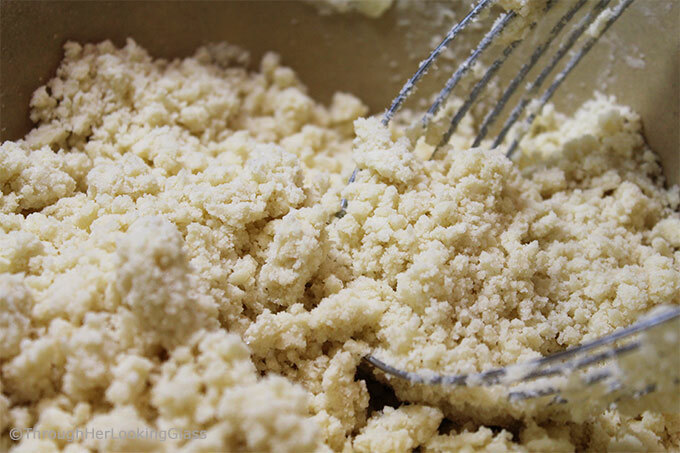 Cut the butter into the flour and sugar with a pastry blender as you do when making pie crust. When all the butter is incorporated evenly (but the mixture is still crumbly), press the dough evenly into the bottom of a parchment lined cookie sheet that has sides. Bake in the oven. Meanwhile, beat eggs together with sugar, lemon juice and zest. Remove crust from the oven and pour the lemony egg mixture over hot crust. Bake until the top is just turning golden brown. Cool, then cut into triangle shaped wedges. Dust with powdered sugar. 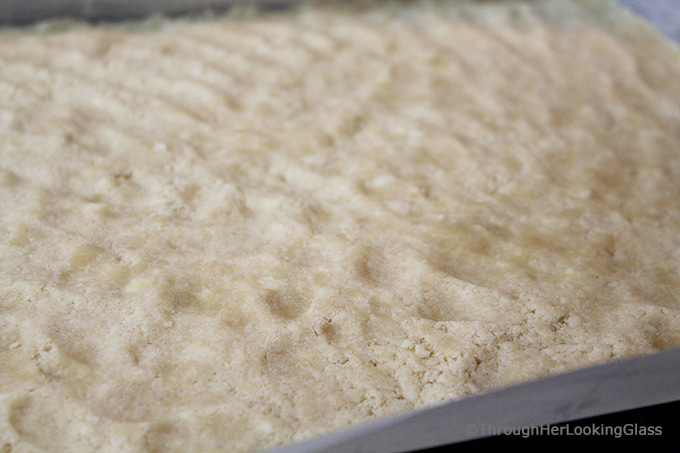 Use a parchment-lined cookie sheet with sides – I used a jelly roll pan that is 11″ X 17″. Pay close attention to the size of your baking pan. If it’s smaller than mine – your bars will be thicker. And if the pan is larger, they’ll be thinner. These bars are good thicker, but I don’t think you’ll want them much thinner, so I don’t suggest using a larger pan. You’ll definitely need to adjust baking times for a different size pan – a smaller pan will take longer to bake and a larger pan bakes faster. Use fresh lemons for fresh squeezed lemon juice and lemon zest. Once cool, cut into squares and then in half again for triangles. These freeze well – I make a panful and freeze half in a freezer zip-loc bag for later. In a medium sized mixing bowl, mix together 2 cups flour and 1/2 cup sugar. Cut in 1 cup butter with a pastry blender (or with a fork )as if for a pie crust. When butter is evenly incorporated and mixture is still crumbly, press into a parchment-lined cookie sheet or jelly roll pan with sides. I used an 11" X 17" pan. Bake for 20 minutes at 325° or until crust is just turning golden. In a medium mixing bowl, beat eggs well. Add in sugar, lemon juice and lemon zest. Pour/spread lemony egg mixture evenly onto hot crust. Bake an additional 25 minutes at 325° until bars are just turning golden. Cut bars into large squares and then in half into triangles. My salivary glands are actually puckering!! I've got to go buy a lemon! These look AWESOME! And now, not only am I craving one of your lemon-y treats, I'm craving a giant eclair :). 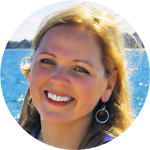 Hope your week is going well, Allie! These look beyond tasty! I absolutely love citrus based recipes for the summer, so refreshing! Luci’s Morsels | fashion. food. frivolity. mmmm... I happen to have some extra lemons I need to use up. I think I have found my tasty goodness for the day! I adore any kind of lemon cake and these bars look incredible, I can totally imagine their taste and consistency. And if you say that both you and your mother have been baking them for so long, then I will have to make them myself. Your pictures are just gorgeous! And these squares are so incredibly delicious! Lemony deliciousness! Thank you for inviting me to be a taste tester. ?Timing is everything!!? Lemon squares bring back childhood memories for me too. I had a children's cookbook that my cousin gave me. Inside was a recipe for lemon squares. So I would make them often as request by my family!! I haven't made tbem in years. These squares are even better! Oh, yes! I certainly have those memories of standing in front of a glass dessert/bakery shop. This lemon slice looks so delicious, Allie. 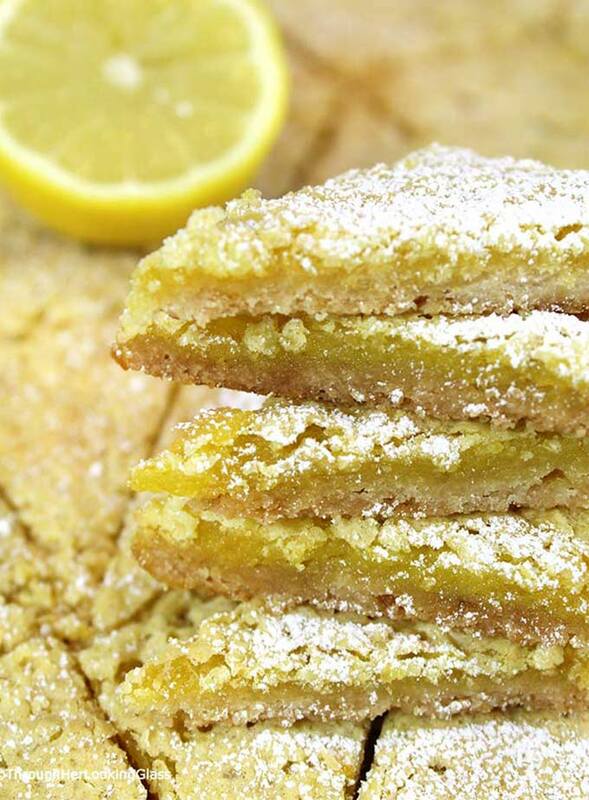 Love how rich and lemony, and these buttery lemon slice bars are. Indeed they would take you back to the glass case at the old-fashioned bakery. I so want these spectacular lemon slices in my life! Just made this and it was really good. I had some strawberries that were on the edge, so I made a make shift ice cream with them. NOM NOM. This is a refreshing treat. Perfect for the hot summer days, Allie! This cake is very aromatic because lemon taste. I enjoyed and often makes both his home. Impressive! I hope you continue to try to continue to produce quality articles like this! Can I mail these bars?